In an important breakthrough in deciphering dolphin language, researchers in Great Britain and the United States have imaged the first high definition imprints that dolphin sounds make in water. Certain sounds made by dolphins have long been suspected to represent language but the complexity of the sounds has made their analysis difficult. Previous techniques, using the spectrograph, display cetacean (dolphins, whales and porpoises) sounds only as graphs of frequency and amplitude. 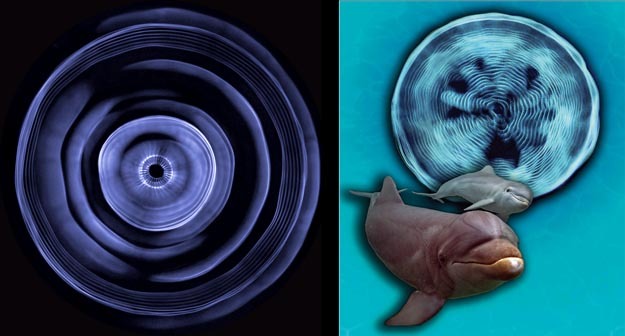 The CymaScope captures actual sound vibrations imprinted in the dolphin’s natural environment—water, revealing the intricate visual details of dolphin sounds for the first time. Within the field of cetacean research, theory states that dolphins have evolved the ability to translate dimensional information from their echolocation sonic beam. The CymaScope has the ability to visualize dimensional structure within sound. CymaGlyph patterns may resemble what the creatures perceive from their own returning sound beams and from the sound beams of other dolphins. Reid said that the technique has similarities to deciphering Egyptian hieroglyphs. "Jean-Francois Champollion and Thomas Young used the Rosetta Stone to discover key elements of the primer that allowed the Egyptian language to be deciphered. The CymaGlyphs produced on the CymaScope can be likened to the hieroglyphs of the Rosetta Stone. Now that dolphin chirps, click-trains and whistles can be converted into CymaGlyphs, we have an important tool for deciphering their meaning." The team has recognized that sound does not travel in waves, as is popularly believed, but in expanding holographic bubbles and beams. The holographic aspect stems from the physics theory that even a single molecule of air or water carries all the information that describes the qualities and intensity of a given sound. At frequencies audible to humans (20 Hertz to 20,000 Hertz) the sound-bubble form dominates; above 20,000 Hertz the shape of sound becomes increasingly beam shaped, similar to a lighthouse beam in appearance. Dr. Horace Dobbs, a leading authority on dolphin-assisted therapy, has joined the team as consultant. "I have long held the belief that the dolphin brain, comparable in size with our own, has specialized in processing auditory data in much the same way that the human brain has specialized in processing visual data. Nature tends not to evolve brain mass without a need, so we must ask ourselves what dolphins do with all that brain capacity. The answer appears to lie in the development of brain systems that require huge auditory processing power. There is growing evidence that dolphins can take a sonic 'snap shot' of an object and send it to other dolphins, using sound as the transmission medium. 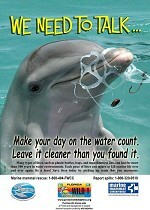 We can therefore hypothesize that the dolphin's primary method of communication is picture based. Thus, the picture-based imaging method, employed by Reid and Kassewitz, seems entirely plausible."